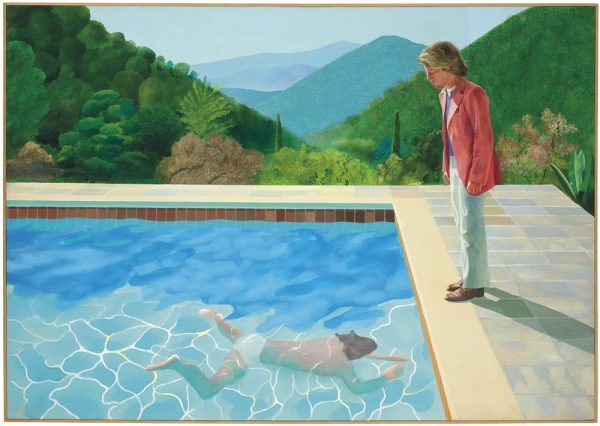 Just as Christie’s has been predicting—one might even say, hyping—81-year-old British artist David Hockney became the most expensive living painter tonight when Portrait of an Artist (Pool with Two Figures) (1972) sold for $90.3 million at the postwar and contemporary art auction in Rockefeller Center. All told, the sale realized a total of $357.6 million, compared with a revised pre-sale estimate of $323 million to $421.5 million. The record-making Hockney’s unpublished pre-sale estimate had been $70 million to $100 million, though much of the pre-sale chatter guessed $80 million as the likely level. Generating almost as much buzz as the sky-high asking price was the fact that the Hockney painting went to the block without any type of guarantee—almost unheard of in this day and age, when consignors know how to play the big auction houses off against one another. He opened bidding for the Hockney at $18 million. It was immediately met with a volley of bids—both from the room and on the telephones. David Hockney, Portrait of an Artist (Pool with Two Figures) (1972). It shot up in $2 million and $3 increments and was in the mid $60-millons within about 60 seconds. 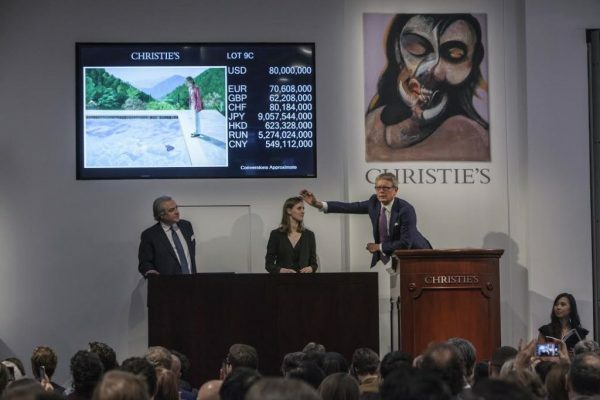 Bidding eventually came down to a two-way war between Christie’s chairman Marc Porter and another Christie’s specialist bidding for a client. They duked it out from about $70 million on, mostly in $500 thousand increments. Portrait of an Artist was finally hammered down to Porter’s bidder for $80 million. The whole process lasted 9 long minutes. The final result made Hockney the top selling living artist, eclipsing the previous record of $58.4 million set for a giant Jeff Koons’ Balloon Dog. It also more than tripled the British artist’s current record of $28.4 million set in May. Hockney’s market has been on a tear of late. The consignor, believed to be British billionaire Joe Lewis, clearly bet big on this work, which he had owned for more than 25 years, having acquired it from entertainment mogul David Geffen in 1993. Though no one knows what kind of financial arrangement he had with Christie’s, the fact that he carried the risk—to the degree that there actually was any—made him the biggest winner of tonight’s sale, hands down.